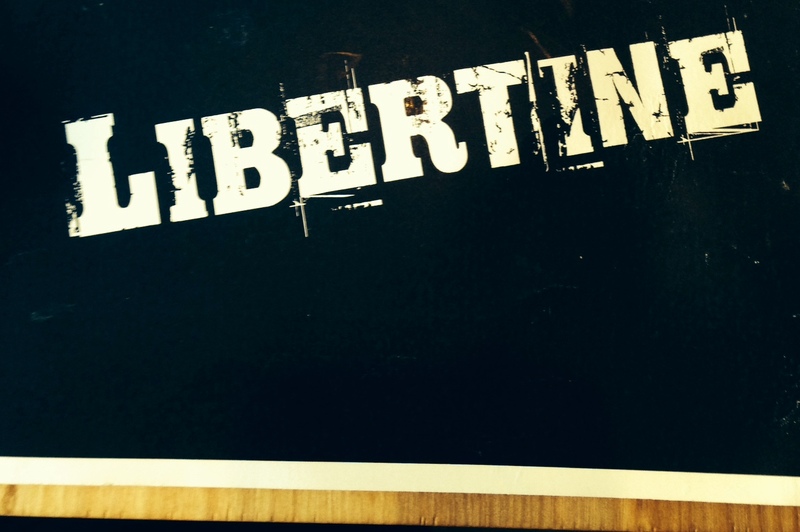 Libertine is the newest addition to the MSP landscape by master Chef Tim McKee. In his latest contribution in Uptown, Chef McKee created a restaurant serving an inventive and diverse menu. Begin your evening from a selection of appetizers ranging from Tuna Poke Tacos to Crispy Pig’s Ear followed by various cuts of beef, lamb, chicken, pork or fish accompanied by creative side dishes. Add to the delicious cuisine a hip and eclectic atmosphere and you have another go-to restaurant. The front room includes an enormous rectangular bar with close to 25 seats on each side. Surrounding the bar are numerous community tables, each offering seating for up to six guests, plus booths along the quiet, inside wall. In the back room are smaller 4-tops hugging the windows plus booths, each capable of handling 4 diners. A few round tables separate the two rooms. Overall the setting is relaxed and a wonderful setting to dine in. The server was forthcoming with her favorites and I chose the “Crispy Pig’s Ears” for my appetizer, plus the “Bacon Chop” and a side of “Kale” for my entrée. The pig’s ear was served with a fried egg, ancho pepper slices, accompanied with a dipping sauce. The menu states lime is included but there was none on my plate nor did I discern any citrusy back notes in the dish. The pig’s ear was sliced into bite sized pieces, breaded and deep fried. I was concerned that the small segments would be tough, but the kitchen cooked them perfectly, soft, tender and when dipped in the spicy-sweet sauce was delicious. When combined with a slice of the spicy ancho pepper and complemented with the creaminess of the oozing egg, this was an incredibly memorable dish. 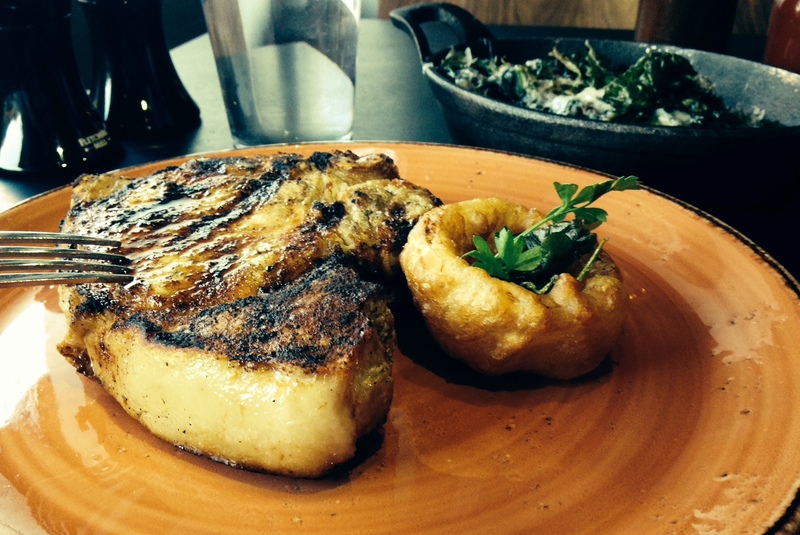 The bacon chop was a Fred Flintstone sized pork chop served with a single onion ring. The server stated that this would be the best pork chop I would ever taste and on certain bites she was absolutely correct. Most of the chop was outstanding. It was moist, flavorful, and perfectly cooked. A few bites were not in the same league, the kitchen lost its focus with the final salting, way too much and it caused my head to snap back with the saltiness. The menu also states “lightly smoked” but manage your expectations…it is more a brined and grilled preparation. The Kale was served with a Manchego cream and garlic. I would best describe this as Kale Mac & Cheese without the Mac. The kale was engulfed in the creamy cheese sauce and was delicious as the bitterness of the kale was balanced by the creaminess of the melted cheese. This was a rich dish that needs to be shared. The server was excellent but the kitchen failed miserably on timing. The server told me that the meal arrives as prepared. The pig’s ear arrived first. After two bites the kale was brought by the runner and two minutes later he was holding my bacon chop. So there I sat with 90% of my appetizer uneaten, and my entrée occupying the remainder of the table. I asked the server to return the entrée and side to the kitchen and let me enjoy the food versus throwing everything simultaneously into the table. She was quick to comply and the manager wandered over to apologize. They turned a negative into a positive so kudos to both of them. Overall I loved the space and the appetizer. The entrée could have been fantastic had the kitchen seasoned the chop properly and it failed miserably on the timing of the food leaving the kitchen. Libertine has tremendous potential and needs a little time to iron out the kinks, deliver the items as described on the menu and serve the food in a manner that allows the guests to enjoy the culinary creations. This entry was posted in Minneapolis and tagged Jeff Schlesinger, jfood, Tim McKee by jfoodeats. Bookmark the permalink.